The Bun and I occasionally go whole-hog with real cocktails and have a martini or two, but it is very rare. The last time we were out and had them, I ordered a second one and he said, “so long, it has been nice knowin’ ya!” Granted, neither of us can really hold our liquor, but a nice martini on occasion makes one feel somehow like an elegant throwback to boozier, yet (seemingly) more refined times. Perhaps I romanticize the cocktail, but it seems like a lot of people are doing so these days. We’ve taken to the trend of buying odd liquors and mixing them with more familiar ingredients. Most recently, we read about the Aviation cocktail, which is a mix of gin, Creme de Violette (yes, a liqueur made with violets), a bit of lemon, and Maraschino Liqueur. The mix is quite good, but comes off a little too overworked for my tastes. I like simpler drinks, with less ingredients, I think. The Maraschino is quite sweet, but has a nice refreshing flavor, so it seemed to us to be a likely candidate for mixing in another application. Drinking it straight is simply too cloying. We initially ended up making this drink just because we had all of the ingredients readily available, but it really turned out to be a winner. Bun says it tastes vaguely holiday-ish, so maybe give it a go at an upcoming get-together to keep the season rolling. 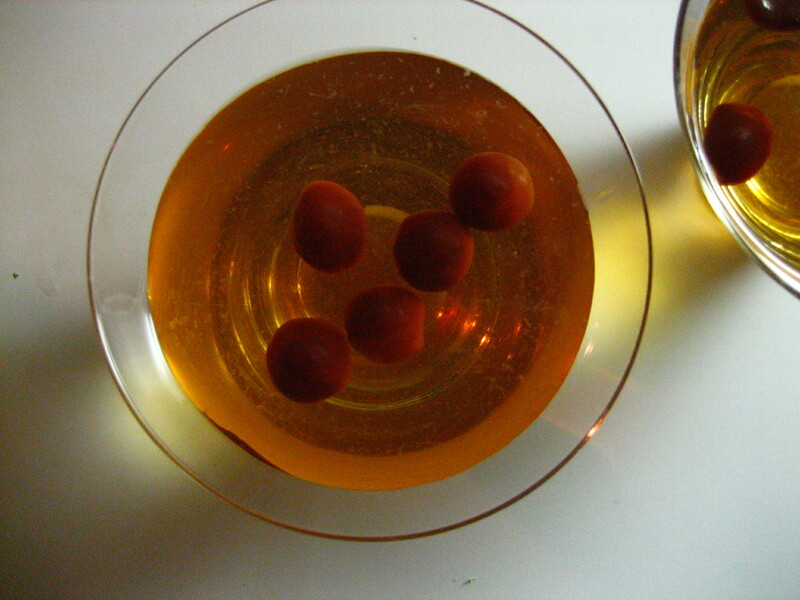 It ends up being a variation on the Martinez, which is sometimes considered the father of modern-day cocktails as we know them. Here, the ratios are a bit tweaked, and we bump up the cherry theme with our own booze-soaked cherries that we made from a bunch we got from Michigan in the summer. Pour all ingredients into a shaker filled with ice and strain into cocktail glasses. Garnish with cherries or a twist. Enjoy! I’ll have to try this sometime. Joe and I recently got hooked on vodka gimlets. Simple and delicious!